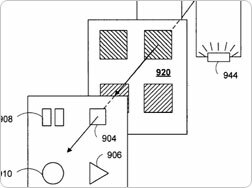 Apple Inc. has just filed a new patent aiming to bring power efficient background display for mobile devices. The innovative idea focuses on ability to illuminate simple messages to users without the need to really turn on whole display module while able to support multiple patterns with predefined context. Typically, turning on a display module in full mode always contributes to excessive current drawn and this innovative idea actually emphasizing on how to have an always-on but yet very power efficient backlight that will able to display simple notification without having actually activating the whole display pixels. For instance, when an SMS arrives, a simple display notification can be brought up without powering up the whole display. Besides, the system is intelligent enough to showcase various messages depending on the status change and users are allowed to configure the behavior based on own preference. It may not necessary mean that Apple will integrate this new idea into its famous iPhone or iPod series but this will definitely bring benefits to industry especially in battery-operated mobile devices when huge power consumption is a concern.